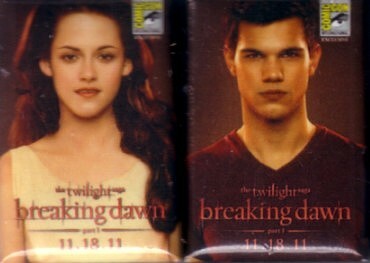 Set of two Twilight Breaking Dawn movie promo rectangular buttons or pins distributed exclusively at 2011 Comic-Con in San Diego (SDCC logo on each pin) featuring Bella and Jacob. Each pin is about 1 by 1 1/2 inches. May have minor indentations, scratches and other flaws. ONLY 5 SETS LEFT.